Fig. 1 The Federation of BiH consists of 10 cantons: 1. Una-Sana Canton, 2. Posavina Canton, 3. Tuzla Canton, 4. Zenica-Doboj Canton, 5. Bosna-Podrinje Canton, 6. Central Bosnia Canton, 7) Herzegovina-Neretva Canton, 8. West Herzegovina Canton, 9. Sarajevo Canton, 10. Livno Canton. One entity, Republika Srpska (RS), was established as a centralized mini-state which decided to develop a much more intense level of cooperation with a neighbouring state—Serbia—than with the rest of its own country. 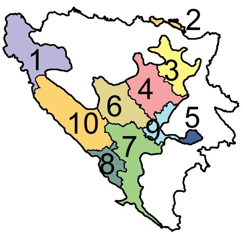 The other entity, the Federation of Bosnia and Herzegovina (FBiH) is fragmented into 10 mini-states or cantons, each of which has almost unlimited power over the education sector (Fig. 1). In addition, there is a third piece of Bosnia and Herzegovina—District Brčko—with its own education policies. Therefore, the State of Bosnia and Herzegovina was left with no responsibilities in the education sector. Namely, according to the Dayton Constitution, BiH does not have a ministry of education at the state level. Because of this unusual organisation of the state, education is highly decentralized and there are 14 ministries in charge of education in BiH: two entity ministries, ten cantonal ministries, a separate administration for education in the Brčko District and a ministry at the state level (The Ministry of Civil Affairs) that has an unimportant role as a coordinator. The BiH Constitution accommodates this state of affairs because, according to Article III (Annex 4 of the Dayton Agreement) 3 all powers that are “not expressly assigned” to state institutions are given to the entities (Republika Srpska and the Federation of Bosnia and Herzegovina), while Section III, Article 4(b) of the Federation Constitution 4 gives the cantons responsibility for “making education policy, including decisions concerning the regulation and provision of education.” Education is thus highly decentralized in the Federation of BiH and highly centralized in the RS, while remaining decentralized in the state as a whole. Therefore, Dayton has created an immensely institutionally complex structure that has made the task of educational reform not merely difficult but gargantuan. While the Dayton Peace Agreement and the BiH Constitution provided the basis for segregation in education, social and political circumstances in BiH immediately after the war made it a reality. After the war, the country was slow to recover. At that time, priority was given to physical reconstruction: fixing up roads, bridges, houses, de-mining and the return of refugees. However, the war continued in an altered form, especially in the education sector. Namely, the division of the country, conquering of territory and ethnic cleansing that could not be achieved by force were continued by other means after peace was established. In truth, many school buildings were reconstructed but, during those initial years of peace, practically nothing was done to change the content of education. Indeed, during the war and immediately after the war, as a result of attempts to divide the country along ethnic lines, the education system was divided. That is how, step by step, three education programs developed in BiH: two were taken from neighbouring countries (Serbia and Croatia, both of which had a significantly negative if not equal role to play in the war in BiH) and a Bosnian program. Unfortunately, this division in primary and secondary schools continues to this day and is probably the greatest problem in our education system. We are not yet fully aware of what the long-term consequences will be, but we can be certain that they will have a very negative effect on the stabilization of this country, its security and, most importantly, reconciliation. In 2002, the OSCE international organization, originally engaged in the organization of general and local elections in BiH, received a mandate to assists in the reform of the education sector. With good intentions and the hope of uniting the primary and secondary education sectors, which were completely separated during and immediately after the war, OSCE organized the so-called “two schools under one roof”—a strange segregated school system. Segregation in education is an abstract and academic term and I am afraid people may not be able to fully comprehend it. For those of you who are not fully aware of its implications, I suggest that you go stand in front of one of these segregated schools (a.k.a. a “two schools under one roof”). You will see children being herded into two different entrances or exits according to invisible and, to them, incomprehensible markers, or, even worse, never meeting each other in the first place because they follow two separate schedules. There are schools where segregation is so obvious that its external manifestation is shocking to perceive. 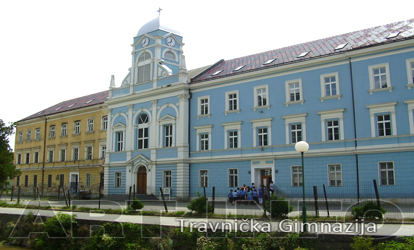 For example, the gymnasium in Travnik building is divided in half: one half is completely renovated, while the other is old and crumbling (Fig.2). Of course, children of different ethnicities attend different parts of the school. 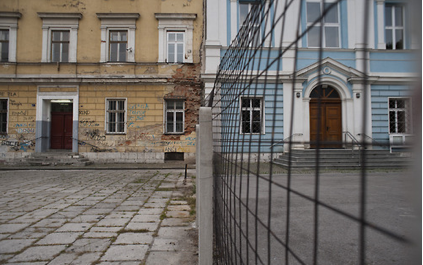 To make matters worse, the school yard in front of the building is bisected by a wire fence so they are not able to make contact even in the space where they spend time between classes (Fig.3). And that is just the surface. If you dig deeper and take a look at their curricula and textbooks, you will see what segregation really means: three dialects, three geographies, and three histories. Questions that trouble me whenever we discuss separation along ethnic lines are: “What happens to all those who do not belong to a constitutive people? Where do they belong? Which school should they attend?”. There are 17 ethnic minorities in BiH, all categorized under the umbrella term OTHER together with all those who chose Bosnian or Herzegovinian (or a combination of the two) as their ethnicity/nationality, a practice (identifying with the nationality of your country) which is completely normal in other countries. Everything else is just details. The people living in Switzerland are Swiss, the people living in Belgium are Belgian, the people living in Germany are German. The fact that some of them may also be Bavarian, Wallonian or Flemish is a secondary matter. OSCE employees have assured me that parents from a segregated school could make a single case before the European Court of Human Rights in Strasburg in order to destroy this unbelievable system of educational apartheid in BiH. I find it difficult to believe that there are no parents among us to do this. Twenty classes have already been educated in this segregated system. Bosnia and Herzegovina has a difficult present, but it is difficult to even imagine what awaits us in the future with generations being educated in a system like this. What kind of future will such generations create once they are in charge of this country? Thanks to this aforementioned education system, we have been raising generations of students that have nothing in common—they are educated in supposedly three different languages and through three different education systems, learning different histories of their country and, what’s worse, have no contact with each other. What kind of future can these generations create once they are in charge of the country?